Nestled in a wooded glen, underneath the evening stars and accompanied by the hypnotic hum of crickets, Topanaga Canyon’s Theatricum Botanicum adds a dose of magic to Shakespeare. The outdoor Globe-like theater simultaneously infuses the Bard with reality and wonder. The march of Richard III’s army down dark, forest-like hills conveys a dimension of realism and immediacy that cannot be matched by an enclosed venue. Similarly, the towering loft used during the Tower of London murder scene enhanced the mysterious mood. 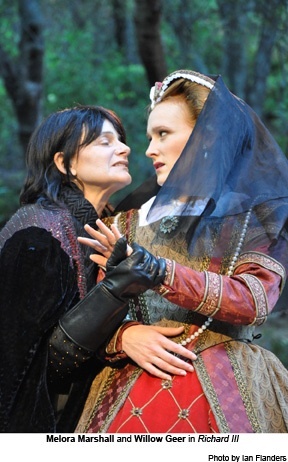 The vast verdant set suspended the audience’s disbelief, as did the cast of talented actors in the Theatricum’s production of Richard III. On Saturday night’s performance, Melora Marshall starred as the protean protagonist, triumphantly suspending the audience’s disbelief that the Machiavellian king could be played by a woman. With a small frame and intense, red-rimmed eyes, Ms. Marshall illustrated that the true source of Richard III’s power emanated from his cunning speech and a knack for manipulation. Marshall elicited sympathy for the murderous monarch not only through her constant limp, but more importantly via the edgy humor that she brought to the role. Marshall’s appealing underdog Richard III is akin to the archetypal schoolyard outcast who through sheer force of determination (and sarcastic zingers) manages to court the most popular girl, topple the In Crowd, and get the audience to root for him. Marshall’s comedic delivery of the line in Act I “Was ever woman in this humor wooed?” (after Richard’s brazen courting of Lady Anne at her husband’s funeral) added lightness to Richard’s realization of his dark powers. The casting of the tall Christopher W. Jones as Buckingham was a brilliant choice; the diminutive Richard bossing around the hulking Buckingham underscored Richard’s rhetorical and manipulative prowess. One scene that humorously embodied Richard’s capacity for mind games occurred during Act III, when Richard “reluctantly” accepts his subjects’ pleas to be their ruler. Through this scene Marshall conveyed Richard’s talent for reverse psychology, another tool in his arsenal of manipulation. With Catesby, Buckingham, and the cast kneeling below him on the balcony, Richard protests innocently, “Why would you heap these cares on me/I am unfit for state and dignity.” The comedy of the scene was further depicted as the murderous Richard posed piously between two clergymen, holding a book of prayer. The gesture was especially biting in today’s world, a salient commentary on the hypocrisy of politicians who don the cloak of religion as a mantle to seduce the masses. The entire cast of Ellen Geer’s production, from the precocious children playing Richard’s young nephews to the booming oracle, Queen Margaret (played by Earnestine Phillips), to the guilt-ridden Second Executioner of Clarence (Dylan Booth Vigus) added to the narrative’s vivacity . At one point, the wrapped bloody head of Hastings is tossed around like a football. Political battles are often a sport. With Marshall’s interpretation of Richard III, we don’t focus on the fact that he was more morally reprehensible than anyone else. What we realize is that in the bloody match of Team Lancaster Versus Team York, the glib-tongued Richard III was just better at the game. 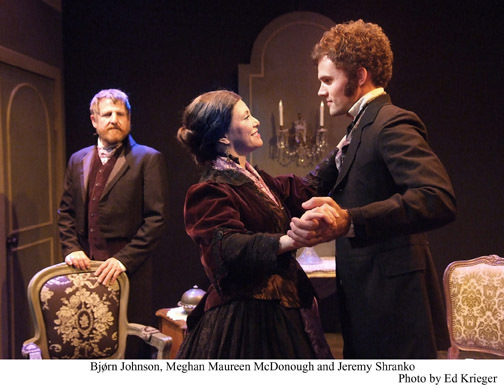 Israela Margalit’s “Trio,” currently playing at the Lounge 2 Theater in Hollywood, offers a window into the artistic triangle between Robert Schumann, Clara Schumann, and Johannes Brahms. Maragalit, a concert pianist, tied the play together with her own recorded compositions of Schumann, Brahms, and Beethoven. Meghan Maureen Mc Donough played the grim, subdued Clara Schumann, a once famous concert pianist repressed as a housewife cooking beans. Mc Donough’s Clara was a woman drained by years of belittlement by an insecure husband who would toss cruel jabs at her, including, “Those who can’t compose, play.”Her father, dynamically portrayed by Peter Colburn, bemoaned the wasting of Clara’s life. Bjørn Johnson, captured Robert Schumann’s madness with pathos, particularly when he called out in the asylum for his beloved Clara, his little “Clashen.” Jeremy Shranko energetically portrayed the arc of Schumann’s protégé Brahms, from naïve tongue-tied ingénue to cunning manipulator. Joseph Joachin, Brahms’ confidante (played by Brian Normoyle) radiated genuineness as a straight shooter, a voice of reason to his flattering friend. The play worked best during the musical sequences. For instance, when Brahms consoled an exhausted Clara, one heard his soothing Lullaby for Piano Solo. The music explained his solace and why Clara turned to him at that moment in time. Another memorable moment was a scene in which Clara and Brahms toyed with tempo, swept away rhythmically during Beethoven’s Appasionata. Margalit’s play was most meaningful when it centered on the music itself. One minor weakness in the play is that structurally, a narrative element was needed to convey expository plot details: perhaps an introductory Greek-inspired chorus, a group of Düsseldorf townspeople, critics or audience-goers commenting on the timeline of the Schumann scandal. This element would have spared the actors from having to recount plot through dialogue (a structural challenge during which they did an excellent job) and instead focus on the immediate and the raw. Margalit’s play begs the question: Can two eagles (artists) live together in domestic bliss? Or will one feel forever caged? The Fountain Theatre’s “A House Not Meant To Stand” deserves a standing ovation. The dynamic cast, its Gothic set spewing forth leaks, and the darkly wry barbs of Tennessee Williams added up to a riveting performance of Williams’ “spook Southern Gothic spook sonata.” From Virginia Newcomb’s rapturous ecstasies as born-again Christian Stacey to Lisa Richards’ slithering portrayal of Jessie Sykes to Daniel Billet’s sensitive portrayal of a protective son, the entire cast brought William’s last play to life. 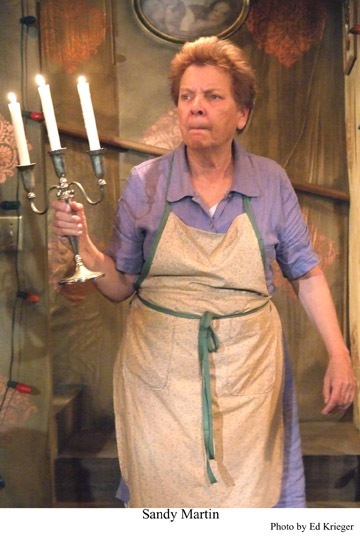 Most strikingly, Sandy Martin fully inhabited the character of Bella Mc Corkle: physically, mentally, and emotionally. Although the play brimmed with zesty zingers, Martin poignantly captured Bella’s confusion and maternal loss with unsettling realism. Martin grounded the play as a spiritual anchor during literal and figurative tempests. 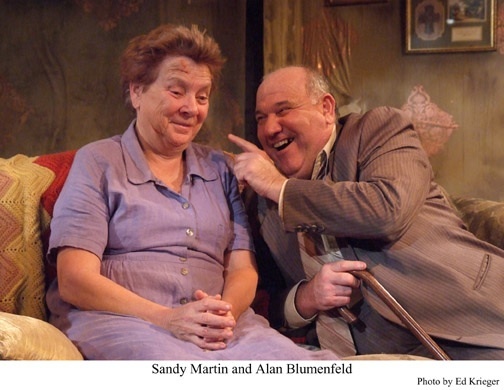 In the hands of less-skilled actress, the play could have veered into slapstick, but Martin’s soulful and whole-bodied interpretation evoked a heartbreak that lingered over the play like a rain cloud. Alan Blumenfeld’s performance (rendered all the more spectacular by the fact that he joined the cast only a few weeks ago) instilled Cornelius Mc Corkle with raw vitality. 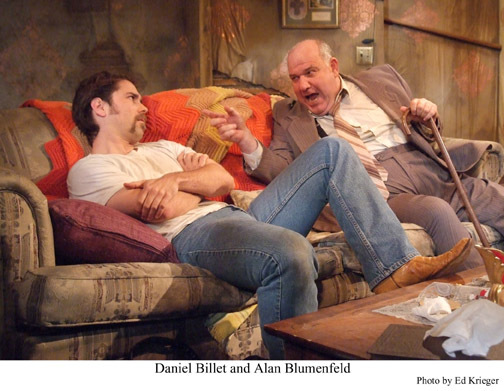 From bellowing rages to sly conspiratorial asides with the audience, Blumenfeld’s vigor and spontaneity honored the dialogue of Tennessee Williams. An actor with a deep range of emotional notes, shades, and undercurrents, he deftly managed to evoke sympathy for his cruel character. When Blumenfeld darkly lashed out at his son Charlie for his deep attachment to “mama,” one could sense Cornelius’ own repressed jealousy and vulnerability, a desperate need for approval channeled through quixotic political campaigns. Finally, accolades must be given to Keith Skretch’s creative and poignant video design. During key moments in the play, a dream-like silllhouette of the young Mc Corkle children floated near their elderly mother, embodying her dreamy nostalgia for her beloved children thrown out by their father. Their plaintive calls to their mom and carefree dances outdoors gathering fireflies, depict Bella’s painful loss. Her constant loving stare at the framed photograph of her boy with the long blond curls, Chip, (bullied for his effeminate look and mannerisms) hinted at the darkness faced by Tennessee Williams for his own personal life. 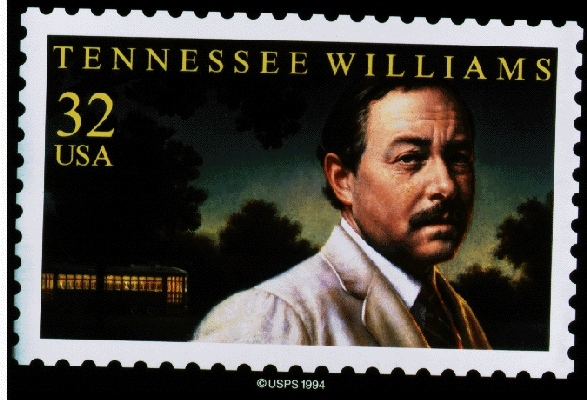 This March would have marked Tennessee William’s 100th birthday. 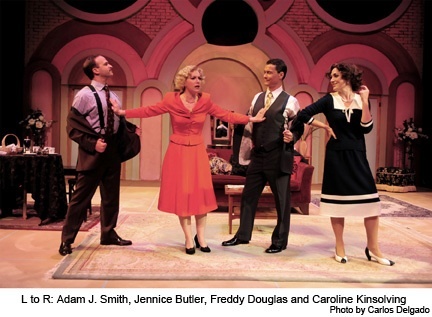 The Fountain Theatre’s “A House Not Meant to Stand” offers a rich and worthy tribute to a master playwright. Happy Birthday, Mr. Williams. Mark Twain may be dead, but his work can still elicit quite a brouhaha. The hilarious West Coast premiere of “Is He Dead?” directed by Shashin Desai at the ICT proves that laughter remains the best medicine. If it were not for the Shelley Fisher Fishkin, the mirth-filled play may not have seen the light of day. Dr. Fishkin, Professor of English and Director of the American Studies of program at Stanford University, discovered Twain’s manuscript in the archives of UC Berkley’s Bancroft Library in 2002. Never produced during Twain’s lifetime, the play debuted in New York in 2007 and this month in Long Beach. Upon entering the International City Theater, one sets eyes on the vivid and visually rich set designed by Stephen Gifford. Beautifully rendered replicas of Jean-Francois Millet’s paintings grace the artist’s atelier, easing the audience into the world of 19th century Barbizon, France. Mark Twain, author of “Roughing It,” and former gold prospector, entered the European world himself during the 1860’s and the 1890’s. Much of the play’s comedy derives from Twain’s juxtaposition of the slapstick humor of the American West with the European sensibility of his cast of characters. The protagonist, French painter Jean-Francois Millet, determined to cast off the “starving” in Starving Artist, becomes embroiled in a scheme to fake his own death in order to drive up the value of his work. The ICT cast spiritedly brings Twain’s comedy to life. Perry Ojeda, poised and dignified as the illustrious artist Millet, turns into a bumbling live wire when disguised as Millet’s buxom and zany “sister” Daisy Tillou. In addition to Ojeda, many of the actors reveal multiple facets of their personalities, creating hilarity. Even before he opens his mouth, Joe Fria, portraying a pompous British art collector, leaves the audience in stitches with his idiosyncratic walk. Later, Fria plays the King of France in one of the play’s zaniest moments, a scene involving a fetid piece of Limburger cheese. Jules Hartley also shines as a chameleon, transforming from the dulcet French lady Cecile Leroux into a mustachioed French gendarme whose eyes throw daggers of rage. The entire ensemble keeps Twain’s zingers flying at breakneck speed. Twain’s play exposes the hypocrisy of a society that often values artists more in death than life. Vermeer and Van Gogh are but two of many artists who lived in considerable poverty although their paintings today bring art dealers astronomical profits,approaching triple digit millions. Twain skewers this injustice, turning what could have been a tragedy into a pleasing melodramatic comedy. It is fitting that Twain once enjoyed life as a gold prospector, because in the esoteric archives of the Berkeley library Dr. Fisher discovered a nugget of comic gold. International City Theater. Long Beach Performing Arts Center. 300 E. Ocean Boulevard. Long Beach.